Around two years ago, I wrote several pieces which looked at how to predict young player improvement. In these articles, I used statistics to demonstrate my doubt that Nick Kyrgios will be world number one by the age of 24-25, and I also made some assessments of the young prospects on the ATP Tour at the start of 2015. I also discussed the potential for bankrolling young players, and I continue to be surprised that this investment does not regularly occur. Simply put, it is impossible for young players to turn a profit playing Futures or Challengers, and such investment will enable them to broaden their tournament selection from a travelling perspective, as well as enabling them to afford more support staff such coaches, hitting partners and physios. In exchange, players would give a percentage of their future income to their investors. Furthermore, it might even allow young players to have a budget for data analysts. Anyone who has spent time analysing tennis data will understand that this area is hugely under-used by players when statistical tournament scheduling as well as data analysis of themselves and their opponents would be a very good way to ensure the player is ranked at his maximum potential. Inefficiency in sport is hardly a new phenomenon, and Tennis certainly isn't any different. 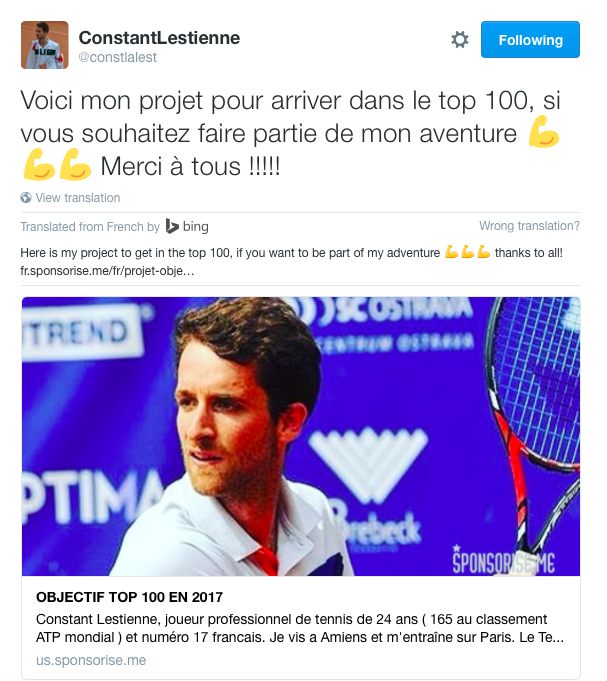 Effectively, Lestienne is trying to obtain funds by crowdfunding, in a bid to break the top 100 in the world. If a 24 year old player who is currently ranked at 165, needs to crowdfund to progress his career, then it is reasonable to assume that other players also have big financial issues, and would significantly benefit from external investment. James McGee, in his excellent blog, also discussed the financial problems that many players outside the top 100 in the world face. The question is - which players make for a good investment? Below is a list of all players aged 22 or below, who are ranked inside the top 300 of the ATP rankings. This age restriction is critical, as previous research indicates that male tennis players tend to improve quickest prior to the age of 23. Six players - Nick Kyrgios, Lucas Pouille, Alexander Zverev, Daniil Medvedev, Yoshihito Nishioka and Maximilian Marterer - have expectation numbers over 100%, which makes them better than the average player at ATP level. Particularly in the latter three player's cases, this is probably a shock to some readers, although I've been beating the drum about Medvedev for over six months. The 20 year old Russian is a HUGE prospect. I expect a big 2017 from Marterer, currently ranked at 176. Breaking the top 100 should be a minimum requirement for the 21 year old German. Based on the age and hold/break data, it's reasonable to assume Taylor Fritz, Frances Tiafoe, Stefan Kozlov, Duckhee Lee, Andrey Rublev and Michael Mmoh are likely to have pretty decent careers. However, five of these players are either American, or have connections to American companies (Rublev is associated with IMG) and therefore are unlikely to struggle financially as much as other players, and also have the ability to 'earn' numerous wild-cards. To find players who are likely to both be good enough to warrant investment, and be in a position to welcome it, we must look at those who are currently flying under the radar a little. In this case, I'd look at the likes of fellow US players Reilly Opelka and Ernesto Escobedo. Both look better prospects than some other American prospects who enjoy a higher profile. Also worth looking at would be the previously mentioned Marterer, Alexander Bublik, Daniel Masur, Maxime Janvier, Cameron Norrie, Kamil Majchrzak and Gianluigi Quinzi, as well as juniors superstars (still aged 17-18) Denis Shapovalov, Stefanos Tsitsipas and Casper Ruud. In addition to this, if Futures data was more widely available, it would also be possible to look further down the 'food-chain' to identify young prospects who would really welcome career investment. I want to finish up by taking a look at Mr. Lestienne. His ATP expectation hold/break data of 94.0% wouldn't put him far off the top 100, so his ambition is definitely realistic. At the age of 24, it's unlikely that he will significantly improve enough for a professional investor to make a large return on their investment, but a solid career is still definitely possible for the Frenchman.